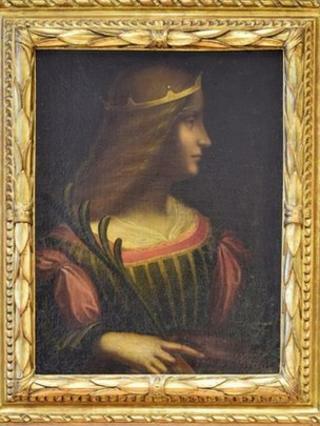 Police have seized a painting thought to be by Leonardo da Vinci from a Swiss bank vault during an investigation into tax and insurance fraud. Negotiations to sell the portrait of Isabella D'Este for 120m euros (£88m) were at an advanced stage, said court officials in Italy. Police were first alerted that a lawyer was trying to sell the artwork without proper export licences in 2013. But their initial investigation failed to find the masterpiece. A separate investigation into tax and insurance fraud crimes uncovered evidence that eventually led police to the painting on Monday in Lugano, near the Swiss-Italian border. Investigators did not share any details about arrests, who owned the painting or how many people were under investigation for conspiracy to traffic art illegally and commit insurance fraud. The painting was attributed to Leonardo Da Vinci after fluorescent light tests, but there will be further examination when the painting returns to Italy. If it turns out to be authentic, the find will be the latest in a series of high profile Italian art seizures. Police took custody of thousands of artefacts and a house that had been turned into a private museum last week; while raids in Basel, Switzerland, led to the breaking up of an art trafficking ring in January.